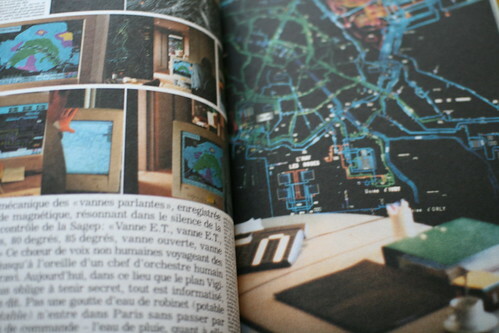 Finally managed to read the oversized Paris ville invisible book by Bruno Latour and Emilie Hermant (1998). 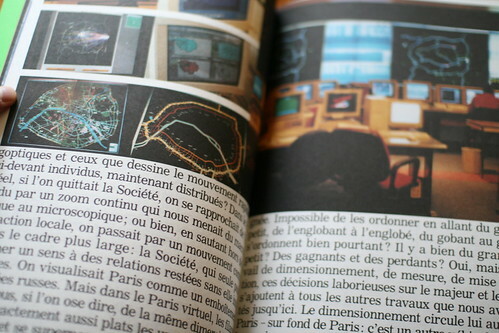 The whole thing is an amazing photographic essay on the "social" and technical aspects of the city of Paris ("social" in Latour's sense). It's a bit like Susan Star's article called The Ethnography of Infrastructure but definitely in Latour's words (and yes it's definitely french). There is also a web version, defined as "a sociological web opera". "Megalomaniacs confuse the map and the territory and think they can dominate all of Paris just because they do, indeed, have all of Paris before their eyes. Paranoiacs confuse the territory and the map and think they are dominated, observed, watched, just because a blind person absent-mindedly looks at some obscure signs in a four-by-eight metre room in a secret place. Both take the cascade of transformations for information, and twice they miss that which is gained and that which is lost in the jump from trace to trace – the former on the way down, the latter on the way up. Rather imagine two triangles, one fitted into the other: the base of the first, very large, gets smaller as one moves up to the acute angle at the top: that's the loss; the second one, upside down in the first, gets progressively bigger from the point to the base: that's the gain. If we want to represent the social, we have to get used to replacing all the double-click information transfers by cascades of transformations. To be sure, we'll lose the perverted thrill of the megalomaniacs and the paranoiacs, but the gain will be worth the loss. (...) The more information spreads and the more we can track our attachments to others, since everywhere cables, forms, plugs, sensors, exchangers, translators, bridges, packets, modems, platforms and compilers become visible and expensive – with the price tag still attached to them. the reader will perhaps forgive us for our myopic obsession with the trails of traces"
"the visible is never in an isolated image or in something outside of images, but in the montage of images, a transformation of images, a cross-cutting view, a progression, a formatting, a networking. (...) In photos and text we've attempted to highlight the role of the countless intermediaries who participate in the coexistence of millions of Parisians. In the series of transformations that we followed with myopic obsession, we would have liked to have kept each step, each notch, each stage, so that the final result could never abolish, absorb or replace the series of humble mediators that alone give it its meaning and scope. " Why do I blog this? The book is a very intriguing read for anyone interested in contemporary cities and their underlying activities/infrastructures. 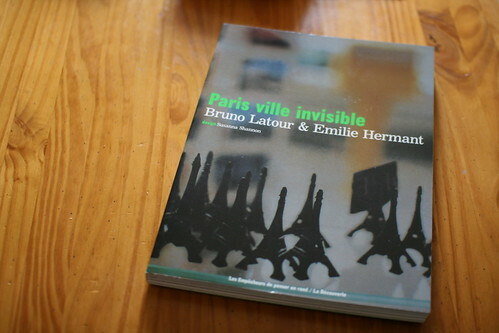 If you liked Italo Calvino's "invisible cities", that book written by Latour (with pictures from Emilie Hermant) is a must read. The notion of traces described here is very Latour-ian to some extent and it's interesting how he uses it to describe what happens in a contemporary city such as Paris. What I find relevant here is this idea of "intermediaries" and the observation of the transformation he discusses. If you've read Dan Hill's post "The Street as a Platform", that book is a theoretical exploration of the issue of technologies in city space. There is of course much more to draw from this book, which I will explore in following blogposts. Sousveillance tactic? Protest against CCTV?